In 1977, her eighty-second year, Keturah Daveney began to write down her memories of her early life in Walworth in south-east London, where she had lived from 1900, when she was five years old, until her marriage. 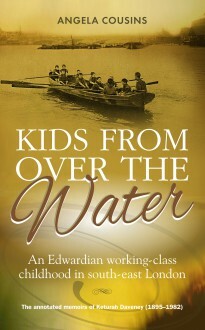 The lives of working-class Londoners in the early years of the century and the ups and downs of existing on the breadline leapt into life from its pages, helped by Keturah’s wit and humour. Recognising the work’s interest as a historical document, Keturah’s niece, Angela Cousins, has now used her writings as the basis for a history written from a 21st century perspective of Keturah, her family and her life and times. It is a touching and fascinating window on the way ordinary people lived more than a century ago.